← Wait, You Have Another Dog? I adore a good summer tomato. My kitchen has a collection of seed packet and crochet art and labels and paintings devoted to this wonderful fruit…vegetable… I began my love affair with it as a child when my dad and I used to have a small garden devoted to them in the backyard. The author of American Food Roots’ piece spoke to me when he touched on the jewel that is the green tomato. My mother used to fry these gems up and the smell of summer would permeate the kitchen and my play area. Salty – floury – acidic tomatoes hit the frying pan and limp rounds would exit – soft and browned and amazingly tasty unlike their raw counterparts. Happy ending days of summer. As school clothes and supplies have started to hit stores and promises of cooler weather are around the corner – behold the summer magic of the tomato…in all of it’s glory – start to finish. My heart just about skipped a beat I was just so excited. 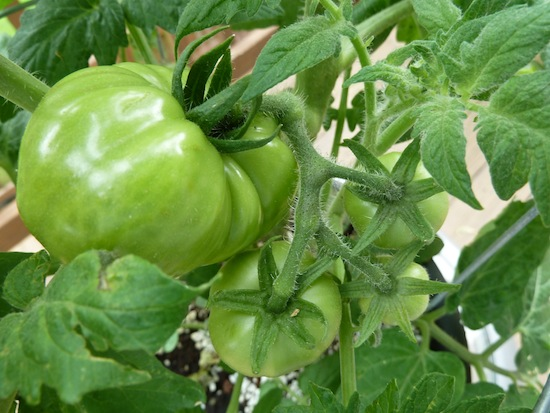 You see, Mister Tom had a rule: No one could pick a green tomato until the first ripe ones had been picked. Now I knew that tomorrow would be the day that Mama would make me fried green tomatoes for supper—yell boy!